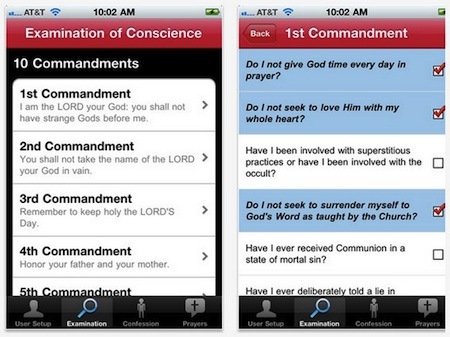 Confession: A Roman Catholic App has been approved by a Catholic bishop for use among churchgoers and lapsed Catholics. Makers Little iApps came up with the idea after hearing Pope Benedict say new media, "can contribute to the satisfaction of the desire for meaning, truth and unity which remain the most profound aspirations of each human being." A spokesperson for the firm said: "Designed to be used in the confessional, this app is the perfect aid for every penitent. "With a personalised examination of conscience for each user, password protected profiles, and a step-by-step guide to the sacrament, this app invites Catholics to prayerfully prepare for and participate in the Rite of Penance." Bishop Kevin Rhodes, of the Diocese of Fort Wayne - South Bend, has even granted the app an imprimatur, an official endorsement from the Catholic Church. The app is not quite a complete confessional; a priest is required for absolution. That's what I get for dialing zen, Joe said to himself.